This collection of Benjamin Franklin quotes includes insights on health, wealth and wisdom. Many of the quotations attributed to him, and especially the aphorisms, are ones that Franklin “collected from many ages and nations.” They weren’t originally written by Franklin. Franklin wrote in his autobiography, “Why then should I give my readers bad lines of my own, when good ones of other people’s are so plenty?” These Benjamin Franklin quotes are packed with knowledge. Learn from others, and sit down and have a read. He that lieth down with dogs will rise up with fleas. Love, a cough, and a smoke, can’t well be hid. Men and melons are hard to know. The world is full of fools and faint hearts; and yet every one has courage enough to bear the misfortunes, and wisdom enough to manage the affairs, of his neighbour. Perhaps the history of the errors of mankind, all things considered, is more valuable and interesting than that of their discoveries. All rot the teeth, and make them look like old things. Benjamin Franklin invented the Franklin Stove and bifocals. Employ your time well, if you mean to get leisure. It’s all about the Benjamin’s. Franklin is honored with his image on the $100 bill. A full belly makes a dull brain. Do better still – sleep supperless. Don’t misinform your doctor nor your lawyer. Keep your mouth wet, feet dry. As a writer, scientist, inventor and more, Benjamin Franklin is a renowned polymath. Love your neighbor, but don’t pull down your hedge. Take it from Richard, poor and lame, what’s begun in anger ends in shame. 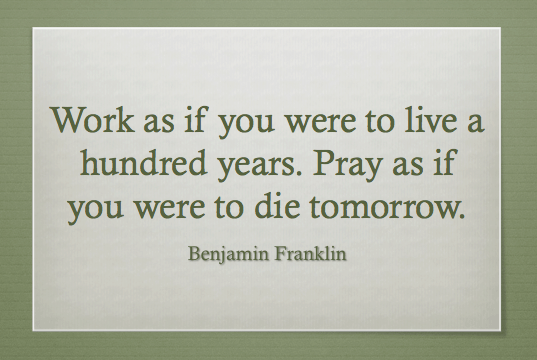 Tip: These Benjamin Franklin Quotes make great photo captions on Facebook and Instagram. He’s a fool that makes his doctor an heir. Do you love life? Then do not squander time, for that’s the stuff life is made of. Did you know: Benjamin Franklin was an early practitioner of the Pros and Cons list to make a decision. Here are some Pros and Cons lists on popular issues. It is as truly folly for the poor to ape the rich, as for the frog to swell, in order to equal the ox. It is hard for an empty bag to stand upright. He that lies down with dogs shall rise up with fleas. After 3 days men grow weary, of a wench, a guest and weather rainy. He that would live in peace and at ease must not speak all he knows or all he sees. Author’s note: Words of wisdom are featured in these Benjamin Franklin Quotes. You can learn a lot. He’ll learn fast enough to speak. Any suggestions for Benjamin Franklin Quotes? Let us know on the Contact page. Thanks.